The different sand formations around Mui Ne are a major attraction after its beaches. 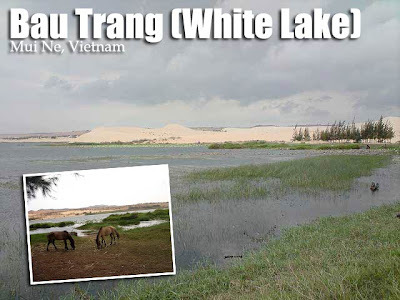 The sand ranges from pure white to gold in the Bau Trang (White Lake), to a fiery red in other areas. We visited several sand formations including the red sand dunes in Fairy Stream and Red Canyon, the white sand dunes in Bau Trang as well as the yellow (gold) sand dunes. If not for the cluster pine trees by the lake, one would think it's a desert in Africa or the Middle East. In Bau Trang, you can ride a horse up the dunes or slide down on a makeshift sled which small kids will tout to you. We booked this afternoon tour in Ham Tien Beach. It was US$14 per person but we had the 4x4 all to ourselves. The ride around was a blast as I enjoyed the wind hit my face as we stood behind the jeep. 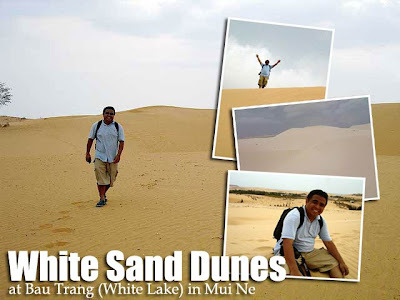 hi..I was in vietnam 2 weeks ago,and we also went to mui ne,I remember this post :-) we went sledding sa sand dunes,it was one of the best experience! 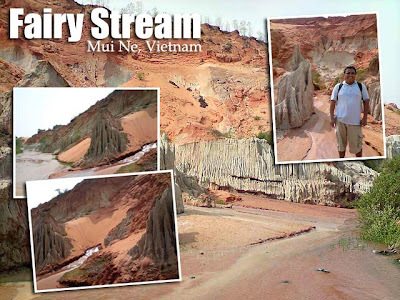 :-) amazing land formations just in one place..we weren't able to see the pink stream though since it rained hard..